A couple of years ago I wrote a post about being called a racial slur in my hometown. The post generated a lively discussion. As a follow-up, we decided to put together a flow chart that illustrates possible courses of action a person might take when an unfortunate incident like this occurs. While choosing to turn and walk away is always an option, those on the receiving end of racism are fully aware that these incidents are upsetting, and sometimes it makes sense to stand up for yourself and others. You will notice after viewing the flowchart that one of the scenarios suggests you unleash a comeback that is so brilliant it literally freezes the provoker in his or her tracks. We left this scenario up to your imagination, but we thought it might be productive (and fun) to post our best comebacks in the comments section below. That way we can all benefit from one another’s collective wisdom. *Note: One possible course of action in the flowchart is a violent response. In light of the Trayvon Martin verdict/incident this scenario is highly risky and deeply discouraged. The biggest and most consistent problem with racial insults is they almost always come out the blue. These insults have a knack for catching you unawares, when you least expect them, leading to feelings of regret and thoughts of what you coulda, shoulda, woulda said had you been ready. So that is what we are going to do here: prepare for the next time it happens. This exercise is all about having the insults come at you slow. Since the incident has not occurred yet, you have all the time in the world to compose yourself and come up with a great comeback. And for those of you who think that racism is a thing of the past, read this essay written by WNBA player Brittney Griner, and this article, both published in The New York Times. So let’s give this a try. Remember, you can come up with a response for an incident in which you are personally being attacked and/or a response for an incident in which someone else is being verbally attacked. I’ll go first. What you just said to me makes you come off as small-minded and uneducated. Is that how you want people to see you? Why did you call him that? Yes, but when you call him that you are offending me too. Are you comfortable being who you are? Are you happy being a racist? What is your name? Would you be fine with your boss, your family, or your friends knowing that you are a racist? I have no witty comeback other than to give a long, drawn-out and eyes-glazing-over historical rundown of the etymology of the slur used. As a woman, when I’ve protested something along these lines, I’ve experienced verbally aggressive responses from the (male) perpetrator, which can make it a little scary. However, I was also told by a woman of color I shared a con panel with “We need you to have our back” when I hear a slur against POC. So, keeping in mind that I should balance safety with justice, I intend to speak up when the situation warrants it. And yes, it always surprises me that people still say stuff like that. I always do like the classic “How would you feel if someone said that to your mother/sister/brother/etc,” although it doesn’t work in every context. This is a most powerful article and chart/visual. Racism is real and we must equip the victims to handle and cope. 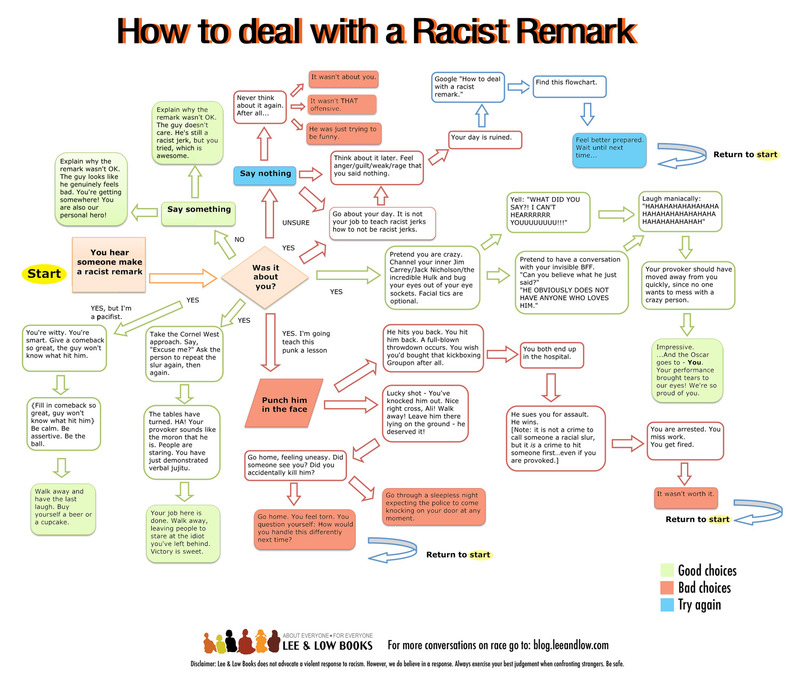 Please see my blog where I used Gordon Allport’s degrees of prejudice regarding the Zimmerman-Martin trial… I can’t find a way to post the diagram at this point. Kudos for your post!! It is not a big stretch to extend this conversation to include gender discrimination. Women especially should take note b/c this exercise could ready you for the next time a sexist insult gets lobbed in your direction. Donna, Please post a link to your blog. I would love to read it. I have a serious smart mouth. this is why I get into trouble. But I will NEVER back down from racism. Me: What you said could be hurtful to someone in that group. Perp: People in that group use that term all the time. Me: You have a family, right? It’s like how you can rip on your brother, but you wouldn’t let anyone outside of your family rip on your brother. Whip out your phone and snap a picture of the racist. Post picture online with the racist quote & the racist’s name.